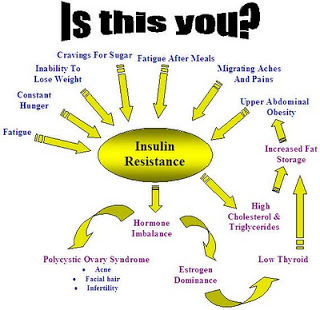 You are here: Home / Hormones and Weight Resistance / Are You Insulin Sensitive? With so much focus on diet and exercise in the fat/weight loss battle it’s easy to over-loo the role hormones play in our health. They can make all the difference. Insulin is a super important hormone that is secreted by the pancreas when we eat and helps to absorb nutrients from the food we eat. When we consume carbohydrates, the sugar in our blood increases and the pancreas releases insulin to help take the sugar out of the bloodstream and to our organs such as the liver and muscles cells where it is used for energy. However when insulin is not working properly, sugar piles up in the blood with nowhere to go and the disease diabetes is the result. Diabetes is nothing to fool around with. Excess sugar in the blood can cause vision loss, hearing loss, high blood pressure and gum disease. The 2 main kinds of diabetes are: Type 1 when the pancreas is at fault and produces little to no insulin and Type 2 which occurs when the hormone insulin is produced but the body does not respond to it right away. The causes of Type 1 diabetes are harder to pinpoint but Type 2 diabetes is…unfortunately, increasingly common. Eating carbohydrates too often (especially sugars) will make you less sensitive to insulin and you can actually develop low “insulin sensitivity” (this is one case of “sensitive” that you want on your side…you do want to be sensitive to the production of insulin), a condition that allows more insulin than is needed to be produced in order to keep blood sugar levels stable. With poor insulin sensitivity, carbs and nutrients are hard to digest which results in weight gain. Not only does insulin sensitivity increase the risk of developing diabetes, it also ups the risk of thyroid problems and different types of cancer. It also makes it very difficult to control body fat. Regular Exercise: That’s a no brainer and plays a role in almost all our health issues. Just 3-4 times a week will improve your overall health and “insulin sensitivity”. Foods we eat: What goes in our bodies will eventually show up in our health. It’s best to follow a diet that’s low in simple processed carbs (especially sugar). After you exercise, the blood sugar spike is actually a good thing because the insulin aids in sending nutrients quickly to exhausted and tired muscles. Green Tea: Green tea is proving itself as a super food and has been shown to reduce blood sugar concentrations significantly. It’s best not to add milk or cream as it undermines the tea’s circulatory benefits. Low Body Fat: Being lean is a good thing and can improve insulin sensitivity. Fasting: Although not everyone has tried fasting, it can help to lower the risk of developing diabetes and other diseases like cardiovascular disease. Lots of quality sleep: Getting enough sleep is crucial in keeping the body functioning at peak performance…and that includes the production of vital hormones. Eat slow digesting foods: These sugars in these foods take longer to hit the bloodstream allowing insulin to be released gradually. Protein, fiber and fats all play a role in this and should represent a significant portion of anyone’s diet. Cinnamon: Believe it or not this spice I a delicious way to control blood glucose levels. Yummy in yogurt and as toppings or even sprinkled in coffee. If you struggle with a fat/weight loss resistance and you seemed to have reached that dreaded plateau, body insulin sensitivity may be your biggest obstacle. Find out how to defeat this nemesis and stop your weight loss resistance once and for all in “Stop Weight Loss Resistance” a complete comprehensive program offering 6 surefire solutions when you just “can’t lose weight”. Filed Under: Hormones and Weight Resistance, Why Can't I Lose Weight?